Soldiers have worn patches, called insignias, on their uniforms from as far back as World War I. I got to learn all about the importance of patches at NASA. Following the lead of military men of yore, there were hundreds of patches commemorating human space flight. Many of the things that appear on patches have special meaning. 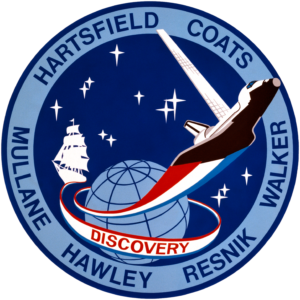 When I came to NASA at the beginning of the Space Shuttle era, I learned that each crew had to have its own patch. My husband Hoot Gibson and I have eight—and there was a story that went with each. 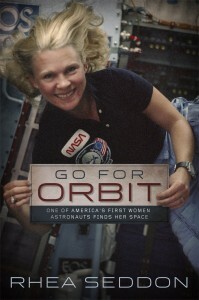 When I was an astronaut, all crew patches had to be approved by the Director of Flight Crew Operations. During much of my career, that was the enigmatic George Abbey. Of course, no such constellation existed, but Mr. Abbey must have given the crew points for audacity—approving the patch. The patch from my second flight is my favorite. It depicts Leonardo da Vinci’s Vitruvian Man symbolizing the flight would study humans in space. The Shuttle orbit forms the double helix of DNA, common to all living creatures. There are seven stars representing the seven crewmembers, but the shape they form has a special meaning for our crew. Bob Phillips, a veterinarian from Colorado, had trained with us but developed a medical problem that meant he couldn’t fly on the flight. The stars form a P for Phillips. Hoot’s STS-71 patch is beautiful. Designed by famous space artist, Bob McCall who painted the wonderful murals in the National Air and Space Museum, it is rich in symbology. The vehicles Atlantis and Mir are shown in separate circles converging at the center. 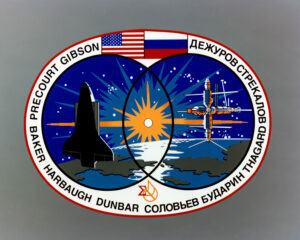 This represents the major purposes of the mission: the first docking of the Shuttle to Mir, and the merger of the space programs of the two space faring nations. The names of the ten crewmembers – six Americans and four Russians (two taken up and two brought back down) circle the patch. The flags of the two nations are depicted at the top. The small combined symbol at the bottom is very special. It combines the symbols of the mission control centers in Houston and Moscow and, for the first time on such an insignia, recognizes the tremendous contributions of those men and women. There were even patches that never made it into production. When told he had to put a dragon on one of his patches, Hoot designed one that turned the Shuttle into a dragon breathing fire on one of the countries we didn’t like at the time. That one never saw the light of day. 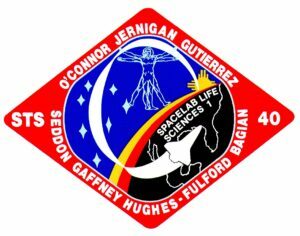 Instead, his STS 61-C patch has a real constellation on it: Draco, the dragon. Some crew patches were artistic, some were beautiful, some were mediocre but they have helped us remember great times as astronauts. Space artist, Tim Gagnon, has designed a patch commemorating the Space Shuttle. Around the edge are the names of all the Shuttles. The Greek letter omega denotes the end of an era. 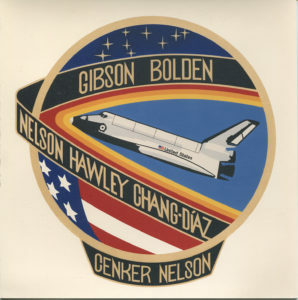 The seven stars remember the crews of Challenger and Columbia, and the stars form the constellation Aquila, the Eagle. And the robot arm coming out of the cargo bay forms a final salute. I enjoy your posts, Dr. Seddon. Curious if Hoot ever found out why George Abbey wanted a penguin on the patch? Thank you Rhea! I am honored to be mentioned in the blog along side of Robert McCall. I had heard the Dragon story before as a request from Abbey, but not the Penguin request. Why do you think he kept doing that? Sounds like he was big into “testing” you all with odd requests to se what would happen! Very interesting perspectives and background Rhea. In hindsight the decision to crew STS-1 could have justified the borrowing of the Wild Weasel squadron patch initials “YGBSM”. 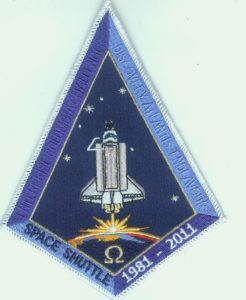 I agree, that STS-40 patch is special! so informative and delightful. Going to save this one for sure. My grands may need this material and information for a science project someday. So glad you are doing this. You are a very talented writer as well as many other wonderful talents.